The Honorable Rosy Sofia Akbar is the newly appointed Minister Health and Medical Services. Prior to taking up this appointment the Hon Minister served as the Minister for Women, Children and Poverty Alleviation, a position she held very close to her heart for the past two years. Minister Akbar joined the civil service in 1990 and took up a career in education sector as being the Assistant Principal and then the Vice-Principal in Ba Sanatan College. In 2003 Minister Akbar completed her Bachelor of Education Degree from University of the South Pacific. In 2009, Minister Akbar accomplished her Post Graduate Diploma in Educational leadership from the University of the South Pacific. Minister Akbar also held the post of President of the Fiji/China Friendship Association for the past two years in her portfolio as Minister for Women, Children and Poverty Alleviation. 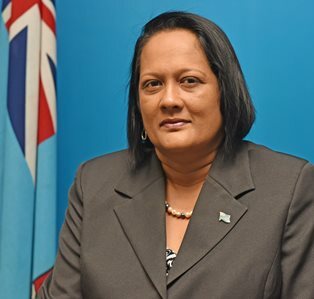 She has also served in the Fiji Teachers Union Ba branch, has been a Board of Control member of the Ba Football Association since 2006 and is the current Vice President. Minister Akbar perseveres to reach out to communities as such she has been influential in creating innovative programs like the Public Consultations, Reach Project and Show You Care Initiative. Minister Akbar is a strong advocate for the empowerment of women and gender development. As such through her leadership, Minister Akbar had forged a multi-sectoral platform for the implementation of Fiji’s National Gender Policy and women’s entrepreneurship programs. Having a passion to serve the marginalized individuals and families in Fiji, Minister Akbar continues to serve with a caring and compassionate heart, which has won the trust and respect of many who look up to her as a woman leader. Minister Akbar has achieved success as an educationist, social worker and an exemplary leader in heading the most important ministries, the Ministry of Women, Children and Poverty Alleviation and now as the Minister for Health and Medical Services. Minister Akbar is a leader who inspires the youths of Fiji that education is a powerful tool to change lives and thrive in one’s personal and professional development. Minster of Health and Medical Services in the current Fijian government and the current Chair of the Regional Steering Group for CRVS in Asia and the Pacific.